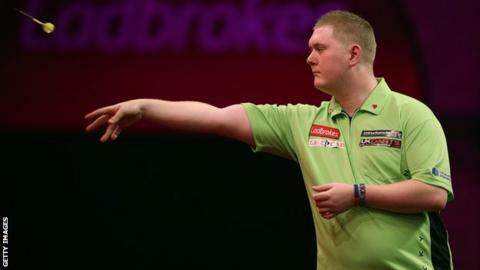 Ricky Evans has asked for Christmas Day off work to help him prepare for his PDC World Darts Championship second-round match with Jamie Caven. The 25-year-old petrol station attendant earned a shock victory over number 10 seed Simon Whitlock and faces world number 22 Caven on Boxing Day. "I am meant to working but I don't want to do Christmas Day," Kettering's Evans told BBC Radio Northampton. "I don't want to prepare for my Boxing Day clash by working in a garage." Evans, ranked 55 in the world, produced a magnificent comeback to beat Whitlock on Saturday after the Australian missed two darts at a double which would have given him a 3-0 victory. Evans said the support from the crowd at Alexandra Palace "played a big part" in helping him clinch the first-round win which guarantees him at least £15,000 in prize money. "When I won the third set - to be 2-1 down - the crowd started singing 'God Save The Queen' and 'There is only one Ricky Evans'," he said. "I was getting goosebumps while I was throwing my darts. As soon as I threw the third [game-winning] dart I just knew [it was going in] because it felt good. "I personally feel like the crowd won me that game, they were that brilliant."